KRAMER J, DE GROOT E & KLEEFSTRA R (2016) A fishing Bluethroat Luscinia svecica. 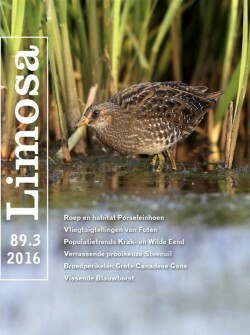 LIMOSA 89 (3): 128-129. On July 25th 2016, an alarming Bluethroat was heard and seen in the nature reserve of Piamer Kooiwaard in the Dutch province of Friesland. Surprisingly, the Bluethroat was carrying a small fish in its beak. When the bird flew into the vegetation, a soft sound of begging juveniles was heard. Whether the fish was fed to its young or that it was consumed by the bird itself remains unclear. Fishing Bluethroats in the wild are not described anywhere in the literature, while in captivity, only two cases of fishing are known.